The Cambodian rice miller and exporter, Angkor Kasekam Roongroeung (AKR), is set to launch its rice husk-powered electricity generator at the start of next year, enabling the company to double its rice exports to 70,000 tons per year. Electricity from the newly-built rice husk generator will be used to–you guessed it–process rice. The plant comes with community perks, too. AKR will sell its excess electricity to nearby villagers at $0.22 cents per kilowatt, lower than the $0.27 per kilowatt price they would normally pay for power from the national grid. “We will take this opportunity to process more rice for export in an attempt to help our rice producers earn more income,” said AKR director, Chieu Hieng, as reported by the Pnom Penh Post. The innovative power source is a welcome addition. Cambodia spent $59 million last year importing electricity from Thailand and Vietnam and is currently co-constructing a coal-fired plant with China at a cost of $362 million. Concerns are being raised about Cambodia’s increasing demand for power and the trend toward using eco-un-friendly coal-fired power. And like other developing countries in Asia–such as Nepal, with its vast Himalayan-sourced rivers and significant dependence on Chinese and Indian investment–the natural resources for natively-generated power exist domestically, but the country lacks the necessary funds for infrastructure development. 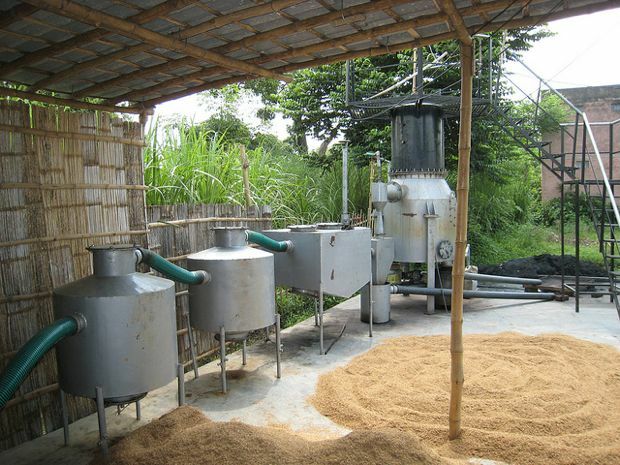 Rice husk generators could become a replicable trend in Cambodia. Already, Golden Rice Cambodia is investing $2 million into a rice-husk power plant to power nearby mills. AKR’s total cost for its plant was $6 million, including the land.